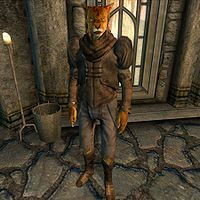 Ma'zaddha is a Khajiit thief living in Crucible, New Sheoth. He is a member of Crucible's secret society of duelists and is, along with several other citizens, part of a major conspiracy to assassinate Lady Syl, the Duchess of Dementia. He lives a relatively quiet existence and spends most of his time inside his house. After waking up at 6am, he crosses the street and enters Sickly Bernice's Taphouse for a two-hour breakfast, returning home to spend two hours of wandering around the ground floor. At 10am, he heads for the Sacellum Arden-Sul where he can be found praying silently while sat on one of the benches for two hours. After heading back to his house at midday, he spends six more hours inside before his dinner, which he once again takes at Bernice's. At 8pm, he heads up onto the rooftop above the taphouse and meets up with the other duelists: Caldana Monrius, Cutter, Muurine and Ushnar gro-Shadborgob. On Morndas, he will fight Cutter and Ushnar, on Middas, he will fight Muurine, and, on Loredas, he will fight Caldana. On all other days, he will just stand near the sideline, cheering and drinking. He will always head back to his house and his bed at 10pm. If he sees you, he will try and get your attention: "Looking, looking. Always looking, I am." When you talk to him, he seems sane at first, claiming to have lost several "things" and will repeatedly ask you if you have seen them: "It's gone... all of it, gone! Have you seen any of it? Any of my things? The others... they think I'm stealing, but I just want my things back." And then, he reveals what he is looking for: "Ah, you again. Have you seen any of Ma'zaddha's things? A shiny spoon, or a broken bottle? I can't find them." When you exit conversation he will make a simple request: "Keep an eye out for my things, won't you?" If you approach him in the evening, while he watches the other Duelists fight, he will recommend: "Tonight's duel should be good. Stay and watch." He wears a typical set of lower-class Dementia clothing: a pair of patchwork pants with a matching shirt and scruffy shoes. He carries around the Duelist's key, his house key, a copy of Liturgy of the Duelists, a leveled amount of gold and a bottle of Ale he drinks from at meals. During his evening duels, he will be equipped with a club. When he isn't fighting, he relies on a set of leveled healer spells and on a leveled major Restoration spell. While not obvious from the start, Syl's paranoia is more than justified and several Crucible citizens are out to get her, including Ma'zaddha. With a bit of painful persuasion from Herdir, the equally paranoid servant Anya Herrick will reveal: "It was Ma'zaddha. He said he was working on behalf of someone else. He told me I needed to help him, or there would be repercussions. I didn't know what to do. 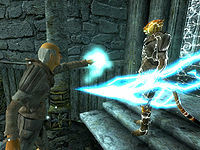 Turning on Syl could cost me my life, but if I don't help, what will Ma'zaddha do to me? You must do something!" As to be expected, questioning Ma'zaddha will prove futile and he will deny everything: "I'm afraid I have no idea what you're talking about." A quick zap from Herdir will make him say: "You may continue to do your worst, Inquisitor, but unless you have some evidence of this preposterous conspiracy, you'll get nothing from me." After the failed interrogation, Herdir himself will provide a bit of advice: "Ma'zaddha is reluctant to speak to you, and I assume there's good reason. It would be worth finding another way to get him to talk." Herdir is indeed correct; several citizens have noticed an unusual meeting between a Khajiit and a Dark Seducer, namely Syl's personal guard Nelrene. With Herdir's help, they will say: "Ma'zaddha and Nelrene... They meet in the street during the night. No one knows what they talk about. ", "I've seen Ma'zaddha, yes. Talkin' to that Seducer, Nelrene. All secretive-like, out in the street late at night. ", "I hear that Ma'zaddha has been seen talking to Syl's Guard Captain, Nelrene, but I haven't seen them." and "I keep to myself, but I see Ma'zaddha and that Dark Seducer, Nelrene, meeting behind the buildings late at night sometimes." "She and Thadon... they've been meeting in secret. They've been doing things together." 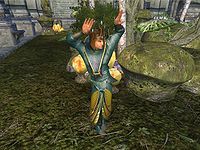 During the meeting, if you expose yourself, Ma'zaddha will quickly end the conversation, saying "Shh! Someone is nearby! We shouldn't speak now. Go, before we're spotted." or "Shh! We are not alone! It's not safe to speak. Go, before someone sees us." If you decide to approach him in the middle of the conversation, he will nervously ask: "What... what are you doing here? There's nothing going on. Leave me alone!" This will immediately cause them to go their separate ways. When you confront Ma'zaddha with the fact that you witnessed the meeting, he will finally break down: "What? I... I... It's for the good of Crucible! You must see that! Please, spare me! I'll do anything!" When asked for his reasons, he will explain the rather delicate matter: "You don't know, do you? She's kept it a secret even from you! She and Thadon... they've been meeting in secret. They've been doing things together. Consorting. You understand me? It cannot be permitted! She must be stopped!" When asked about the orchestrator of the conspiracy, he will cut you a deal: "I don't know, besides Nelrene. She's taking orders from someone, but won't tell me who. If I find out, will you promise to spare me?" Two options are available; either accept to spare him or play hard. The former will have him say: "Thank you, thank you! You are too kind. I shall bring you names, I promise. Meet me in my house tomorrow at midnight. I'll have the information for you." If you choose the latter option, he will be more humble: "Okay, okay. I'll get the names, and then you'll see. It will be worth it, I promise you! Meet me in my house tomorrow at midnight. I'll have information for you. Just please spare me." Ma'zaddha will then break off his routine one last time, positioning himself on the ground floor of his house, waiting for you to return after midnight. When you arrive, you will find him lying on the floor, slain by an unknown killer, presumably Nelrene or the mastermind behind the plot. When you search his body, the liturgy will be gone, along with the duelist's key, now replaced with the key to his cupboard upstairs. Later on, when you find his crinkled note hidden in the cupboard, Ma'zaddha will end up victorious even in death, revealing local gossiper Muurine as the brain behind the conspiracy. After the quest, a tombstone will appear in New Sheoth Graveyard reading: "Mazaddha found that which he did not seek -- the sharp end of a blade." Someone new is trying to get into the Shivering Isles. I'd better hide what little I have left. I heard the Gatekeeper is dead. He didn't have any of my things on him, though, so it's no matter. If the Resonator is working, it means fewer people to steal my things. More of a chance to find what I've lost. Good in my book. Thadon has his Chalice back. Why won't anyone help me replace what I've lost? I don't suppose during all this torture anyone asked about where my things have gotten to. Or who stole them. I used to have a Great Torch. Where did I put it? That one is relit, which is a good thing. Mine's still missing. Perhaps the new head of Dementia can do something to help people protect what's really theirs. Now that Thadon is dead, I should see if he had my things in his quarters. The End is coming. You just wait, you'll see. Time to gather up your things while you can. They built a new Gatekeeper, did they? Hope they didn't use anything of mine when putting him back together. It's about time someone restores some order around here. Just when I thought I was making some progress, I hear that Sheogorath himself has gone missing. Is this the end? Just because the Isles didn't come crashing down around our heads doesn't mean everything is fine. The corpse you encounter during the related quest is actually another NPC: SEMazzadhaDead. He is identical in appearance and faction but differs slightly in inventory. 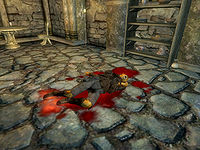 The 'live' version is disabled after Stage 80 and once the player is outside his house; at the same time enabling the 'dead' version. The card Lady Syl's Cruelty in Legends depicts Ma'zaddha being tortured, as seen during the related quest. 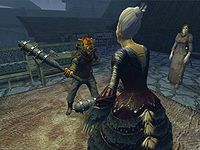 Ma'zaddha has the same bug as the other members of the Duelists and can often be found to be carrying huge amounts of weaponry; in his case, clubs. These will not be found on his corpse during the related quest, as the body encountered is a different object. This page was last modified on 26 January 2019, at 23:30.